KlowdTV is proud to announce that it will stream the IBO Super Featherweight title bout between Shavkatdzhon Rakhimov and Robinson Castellanos on Sunday, August 19th at 10:00 AM EST / 7:00 AM PST. Rakhimov of Ekaterinburg, Russia will be fighting in front of his hometown fans. The 23-year-old Rakhimov is a three-year professional who already has great victories over Visita Gairabekov (1-0), Mirzhan Zhaxylykov (9-0), Rogelio Jun Doliguez (21-3-2), Jimmy Paypa (19-3-1), and Emanuel Lopez (27-6-1). In his last bout he won the IBO Super Featherweight title with an 8th round stoppage over former world champion Malcolm Klassen on February 10th. Castellanos of Celaya, Mexico has a deceiving record of 24-13 with 14 knockouts. The 36-year-old Castellanos is a 16-year professional, who started out slowly by only going 7-9 in his first 16 bouts. Since then he has gone 17-4 with big wins over Alejandro Sanabria (24-0-1), Christopher Perez (19-0), Alberto Garza (23-4-1), Aldimar Silva (12-1), Orlando Rizo (14-2), Miguel Angel Gonzalez (16-3-1), Omar Estrella (16-4-2), former world champion Celestino Caballero (36-4-2), former world title challenger Ronny Rios (22-0), former world title challenger Rocky Juarez, and former world champion Yuriorkis Gamboa (26-1). 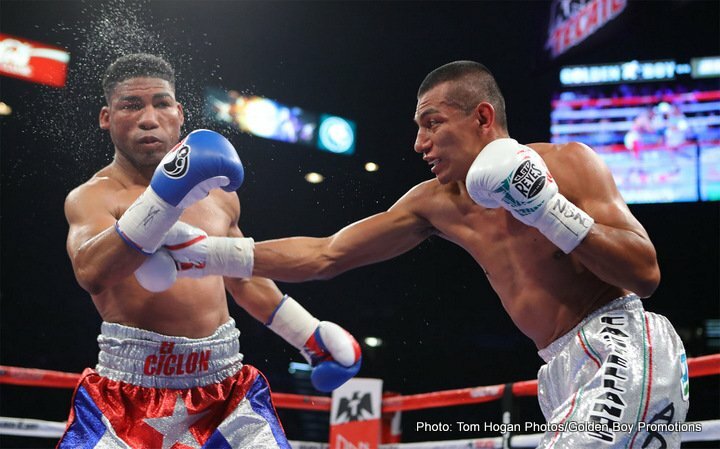 In his last bout, Castellanos competed for the WBA Super Featherweight title, but came up just short as he was on the wrong end of a controversial technical majority decision with Jezreel Corrales on July 15th. The Rakhimov v. Castellanos bout is available on KlowdTV to United States viewers only. There will be no free trials available for live boxing events. Previous boxing news: Poindexter Knight, Jr & Joshafat Ortiz ready for action tonight in Philly!